Product prices and availability are accurate as of 2019-04-21 08:28:50 UTC and are subject to change. Any price and availability information displayed on http://www.amazon.co.uk/ at the time of purchase will apply to the purchase of this product. 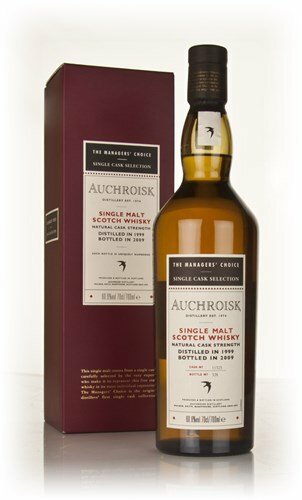 The Single Malt Whiskey Store are proud to stock the famous Auchroisk 1999 - Managers Choice Single Malt Whisky. With so many on offer these days, it is great to have a name you can trust. The Auchroisk 1999 - Managers Choice Single Malt Whisky is certainly that and will be a perfect acquisition. For this price, the Auchroisk 1999 - Managers Choice Single Malt Whisky comes widely recommended and is always a popular choice amongst many people. Auchroisk have included some great touches and this equals good value for money. "70cl / 60.6% - A 9 year old, cask strength, single cask Auchroisk from Diageo's Managers Choice range. This was distilled in 1999 and aged in a single sherry cask (number 11323) for 9 years before bottling in March of 2009. A release of 642 bottles."